Feeling overwhelmed with all of the different ways to solve multiplication and division problems in the 21st century? Why can’t we just do it the way we learned, with one answer and only one way to find it? Join Shannon to transform the way you think about solving multiplication and division problems and helps you enable your students to explain their thinking in multiple ways. 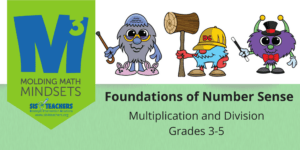 Participants will create a toolkit of strategies to help implement various means of solving multiplication and division problems (3 ways plus the traditional, with concrete-pictorial-abstract means) in your classroom tomorrow!